To eradicate the scourge of unemployment and youth restiveness, Fountain Initiative for Social Development (FISD), said it is empowering youths to promote self-reliant and wealth creation through skills acquisition. The programme, which is part of the group’s Corporate Social Responsibility initiatives, is targeted at creating a new breed of entrepreneurs among Nigeria’s youth population. FISD Enterprises Academy Programmes Manager, Mr. Emeka Okonta, said at a forum in Lagos, that the trainees have access to mentorship and internship programmes and grant support are also available to trainees at the end of the period. He maintained that trainees have the opportunity to benefit from industrial expenses, internship/shadow entrepreneurship, access to funds, tremendous employability advantage, membership of enterprises network and free domain name and web design among others. According to him, FISD has provided support for youths and adults seeking to build careers or becoming self-employed by giving practical technical training in a variety of key vocations. Reiterating the Non-Governmental Organisation’s commitment to making youths self-reliant, he pointed out that unemployment persists because young people are denied of opportunities to grow their passion into thriving business. The Programme Manager FISD Vocational Training Centre, Mr. Lekan Adeleke, disclosed that Fountain Initiative has empowered hundreds of young Nigerians since inception to reduce employment and boost self-reliance through vocational trainings such as tailoring, baking, weaving, beauty and others that are in high demand. He advocated that youths should be educated in any skill of their choice even while still in the higher institutions to enable them to be self-employed and add value to humanity. The FISD, Mr. Fola Kudehinbu, advised Government to leave vocational training for Individuals and private organisations and concentrate more on governance, economic and social development. 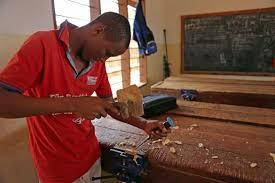 He observed that over the years, government intervention on vocational training have not been very successful, due to several factors, such as lack of proper implementation, transparency and accountability and inconsistency. Kudehinbu urged an entrepreneur to start his or her business small and grow it big by putting on good business plans, discipline and using right skills that will boost the business.